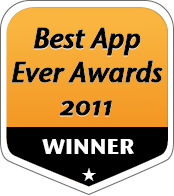 Riot Rings has won the Best App Ever Award 2011 in the category Best Family Game for Android, beating popular titles like Monopoly from Electronics Arts, Jenga or The Game of Life. The fourth annual competition saw over 1.5 million total votes cast (over three times the number cast last year) from the public who chose from 1,692 unique apps. We are very happy and proud on this great success and would like to thank all our voters. 2 comments for "Riot Rings wins Best App Ever Award"
Wünsch euch viel Erfolg, Spaß, ganz viel Geld und dass ihr euch nie ernsthaft zerstreitets! Vielen Dank für die lieben Wünsche. Wir wünschen dir auch alles Gute in deiner neuen Rolle!